PASADENA — “Gajin Fujita: Ukiyo-e in Contemporary Painting” is on view through Oct. 7 in Pacific Asia Museum’s Focus Gallery. 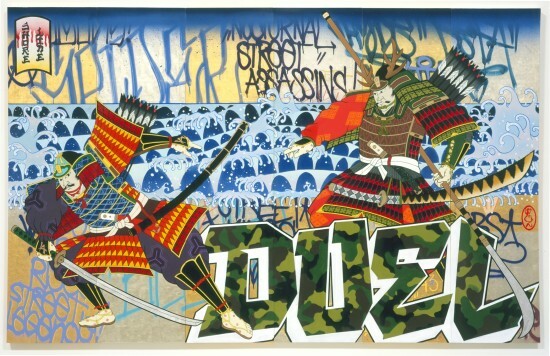 Born in 1972, Fujita is a Japanese American artist whose work combines elements of traditional Japanese ukiyo-e art with contemporary American street art and pop art, among other influences. A native of Los Angeles, he has been steadily gaining international recognition since his first solo gallery exhibition a decade ago. The exhibition at Pacific Asia Museum will be his first solo museum exhibition on the West Coast. Gajin Fujita’s panel paintings are rendered in the spray paint and markers frequently used in graffiti and street art, which would seemingly not allow room for the presence of traditional elements. His range of experiences, from growing up in Boyle Heights with a strong connection to the classical arts of Japan, to creating works both in studio and urban settings, gives him the versatility to move among several worlds simultaneously. It is through his unique approach that references to Japanese woodblock prints or ukiyo-e (“pictures of the floating world”) materialize, and convey a singular mix of wry humor, cultural connection and respect for technique. This selection of Fujita’s recent works opens interesting points of comparison and conversation with those of 19th-century woodblock print artist Tsukioka Yoshitoshi on view beginning May 18 in the Changing Exhibition Galleries. 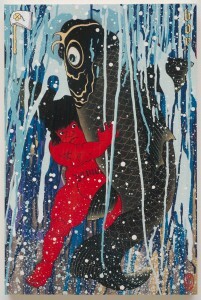 This exhibition is timed to coincide with “Masterpieces of Tsukioka Yoshitoshi” as Fujita’s work shares many parallels with the work of the earlier master concerning compositional approaches, the struggle of man in nature, attention to finished surfaces of the work, and a featuring of Japanese folklore and tales of valor and the supernatural. The exhibition is supported by the Pasadena Art Alliance, Toyota Financial Services, the Los Angeles County Arts Commission and Sid and Betsey Tyler. Held three times a year, afternoon Family Festivals are some of Pacific Asia Museum’s most popular events. In addition to free admission to the galleries, visitors of all ages enjoy live music, crafts, cultural dance, demonstrations and hands-on activities. On Sunday, April 22, from 12 to 4 p.m., come celebrate the centennial of Japan’s gift of 100 cherry trees to Washington, D.C. with crafts, activities and performances. Little Tokyo Karate Dojo demonstration at 1 p.m.
Taiko Center of L.A. performance at 1:30 p.m.
L.A. Kimono Club fashion show and demonstration at 2 p.m.
Kotobuki No Kai folk dance performance at 3 p.m. The museum also offers a fun hands-on exploration of the legendary Silk Road. Dress up as a trader, monk, camel handler, dancer, artisan or silk maker, plan your journey on the maps, relax in a tent, touch real silkworm cocoons, and more. Pacific Asia Museum is located at 46 N. Los Robles Ave., Pasadena, and is open Wednesday through Sunday from 10 a.m. to 6 p.m. Admission is $9 general, $7 students/seniors, and free for museum members and children under 12. Admission is free every fourth Friday of the month. For more information, visit www.pacificasiamuseum.org or call (626) 449-2742.